What Is A Bounce Rate And Why Is It Important? 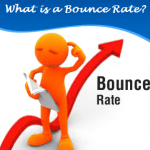 PUBLISHED: JANUARY 24, 2014 – BLOG: WHAT IS A BOUNCE RATE AND WHY IS IT IMPORTANT? What is a bounce rate? A bounce rate is a term that’s used to measure the amount of visitors that visit a page on your site, then leave the page or continue to browse your site. Having a good bounce rate means that the user experience on your website is good and visitors that visit are impressed and have found exactly what they have searched for. They do not have to look else where on the web for the term they searched for. How is a Bounce Rate Calculated? When a visitor lands on one of your landing pages and either finds what they are looking for or continues to browse from page to page because its exactly what they are looking for you will have a good bounce rate. If they find what they are looking for there is no need for them to go back to Google and look at any other site. Even if they click on a link that you recommend that takes them to another website that’s also fine, you loose the visitor but the important factor is they have not left your site and returned to Google to search for the same keyword term. When visitors leave the page they landed on and return to Google and repeat the search it tells Google your page is not the correct page for that search term, if you have enough visitors doing this Google will place other pages above your page in search results loosing you visitors. Its important to check which of your landing pages have this problem using your analytics and possible re-optimize the landing page. Having a good bounce rate for a website tells you that your site is highly optimized for its keywords. And your landing pages are well placed in search results for the primary keyword of the page. It means that the visitor found exactly what they were looking for. The bounce rate is calculated by dividing the number of visitors who viewed only one page or a number of pages by the total number of visitors to the site. Its also about how long visitors spend on a page, if visitors spend a lot of time on each page they visit this indicates to Google that the visitor took the time to read all the content on the page and they found it interesting. You have heard it all before content is king, and having good unique keyword rich content that is written for humans and not spiders will help increase your bounce rate. Also having a good menu navigation system and long tail keyword links in content will help visitors to find more pages on your site decreasing your bounce rate. Visitors land on your landing page and leave in a few seconds going back to Google and repeat the search to find a better website than yours. This will cause your bounce rate to be high. The bounce rate of your site is a good indication of how well your site is set up and optimised and should be check regularly. Having a bad bounce rate means you have some work to do. Use your analytics to find the weakest landing pages that have the highest bounce rate and see where you are going wrong. Slow loading pages can effect your bounce rate, think about it visitors arrive on the landing page and if its still loading after a few seconds they click the back button back to Google. Check the website speed of each page on your site make sure they fast loading. Hosting can also cause problems creating slow loading pages due to slow hosting think about moving your hosting. If you would like super fast hosting use GreenGeeks they great and will even move all your files for free, save $30.00 on one years hosting enter voucher code create30 I use them to host this site. Make outbound hyperlinks open in a new window. Visitors clicking on external links on the page, will be registered as a bounce unless you tick the “open link in a new window” box. Also your page is still open on their computer while they look at the other site, increasing the time they spent on the page. Increase the number of internal links on pages keeping your visitors engaged on your site. High bounce rates typically indicate that the website isn’t doing a good job of attracting the continued interest of visitors. As a rule of thumb, a 50 percent bounce rate is average. If you surpass 60 percent, you should be concerned. If you’re in excess of 80 percent, you’ve got a major problem. Use your analytics or Alexa to check your bounce rate and if its high do something about it. Below is our bounce rate on Alexa. Check your bounce rate regularly, from your bounce rate you will know two things. You’re acquiring the wrong kind of traffic to your page(s). If your bounce rate is below 40% well done. Bounce rate from 41% to 60% room for improvement. Bounce rate from 61% to 100% you have lots of work ahead. Why it’s important to reduce your bounce rate? Reducing the bounce rate on landing pages that have the highest volume of traffic from your highest converting sources means more engaged visitors and a greater chance of conversion. Remember less is best people don’t like a site that is full of adverts and affiliate banners, especially if they cant find what they looked for in a few seconds. Keep the design clean and fast loading with lots of good content, if you give them what they are looking for and more they will spend time browsing your website and you will have a low bounce rate. Hope we helped you understand a little more about your websites bounce rate.